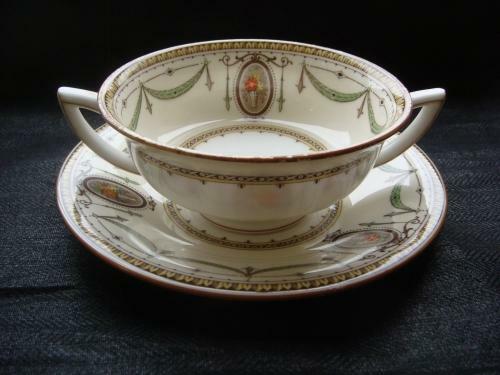 Lovely Art Nouveau Styled Minton Double handled Soup Bowl & Saucer 'Melrose' pattern. In good condition with no chips or cracks, there is some wear to the gilt of the cup which does not detract from its charm. Soup bowl measures 5cms High 11.5cms in diameter, saucer 15.5cms in diameter.